Let’s face it: B2B marketing and public relations doesn’t always have the same allure as its shinier consumer counterparts. It has its own unique challenges – which is not to discredit B2C industries because they certainly come with their own difficulties as well. But on the B2B side of the house, it’s not always easy to find the key to success when it comes to content and social media. How can you stand out and keep people coming back for more? And how can you use your content to drive sales? Just because your brand or clients fall within the B2B space, it doesn’t mean you should avoid churning out regular content and establishing a solid presence on social media. In fact, it means the complete opposite. The buying process doesn’t always happen in a matter of a day; it can happen weeks and months after the first touchpoint between buyer and vendor. During that process, you need to be creating content that gives your audience a reason to keep paying attention and ultimately decide to make a purchase. 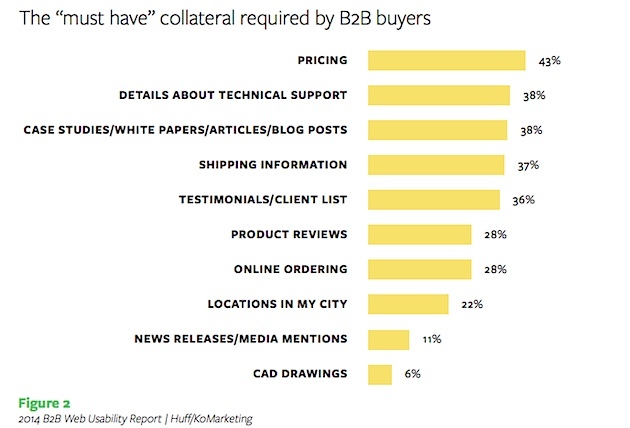 A recent survey from KoMarketing Associates found that white papers, articles and blog posts were tied for 2nd when it came to ‘must have’ collateral B2B buyers want on a vendor website – second only to pricing and tied with technical support details. This is further proof that there are plenty of opportunities to grow your B2B business using content marketing. Here are three pieces of advice to help step up your content game. Know Your Audience. This should be common sense by now, but it can’t go unsaid. Before you create any sort of content, it’s important to know whom you’re creating it for. From the get-go, you should know who your core audiences are – the active or potential buyers of your product or service, including the industry they work in and the level at which decisions are made at within their company. Dig beyond that. Find out where your audiences live in their digital lives: is it LinkedIn? Twitter? Do they read particular trade magazines or websites? There is a ton of data out there that has been sliced and diced to show different demographics and their social networks of choice. If you already have an established social media presence, use tools like Google Analytics to see which networks drive the most traffic to your website. This will clue you in to where your audience has their eyes and ears open. Create Value. B2B content does not have to be boring. At the end of the day B2B marketing has one major thing in common with B2C: you’re marketing to people. A business isn’t making a B2B purchasing decision, a person is. And those people don’t want to read bland, boring content. They want something compelling, interesting and valuable. Arm them with content that leaves them with a new piece of knowledge they can take with them into their daily lives. This will keep them interested in coming back to see what else you have to say. As you create content, limit yourself from being too self-promotional. Find ways to convey what you do through stories and useful information. Let’s use ourselves — SHIFT — as an example. As we develop our content strategy, we look to incorporate original research, data and advice focused on the industry, not solely ourselves. Hence, you find types of posts like the one you’re reading this very second and why you’ll see us sharing relevant industry news on our social channels. No one wants a friend that only talks about themself; that’s true in business too. Convince your audience that you’re smart at what you do. That will help lead to what you want in the first place: sales. If you’re struggling to come up with ideas, stop for a minute, take a deep breath and put yourself in the shoes of your audience. What would you want to read if you were in their position? This is one way to think about what topics to focus on within your content. Promote and promote some more. Once you’ve created your content, you can maximize its reach by promoting it across various channels. This ties back to our first point which was knowing where your audience spends time online. At the very least, you should be sharing your posts, white papers, webinars, etc., on your social channels. This is completely free and gives you another way to get in front of your audience. If you’re in an industry where most decision makers spend time on LinkedIn, you can place focus on promoting your content there and sponsoring posts to reach your target audience, including new prospects who might not know about you yet. On Twitter and Facebook, you now have the option to target custom audiences, such as customers and prospects already on your email lists. This means your latest eBook can get in front of people who know about you but haven’t converted yet. Remember to check your Google Analytics data to see where your audience is coming from and spend time promoting on those channels. At the end of the day, your goals as marketers and PR pros include generating awareness and creating leads. Just because it doesn’t fit in your brand to hand out free burritos to your first 100 retweets doesn’t mean you can’t become a fan favorite among your own audience. Consider the tips we listed above and build out a strategy that works for you. How much will you need to pay Facebook?